After a journey of fifteen years, Ward is back to where it all started: Biobest. With his broad experience in both commercial and technical aspects of biological pest control, Biobest’s new sales manager really knows the tricks of the trade. In the middle of January 2015, Ward joined Biobest as sales manager for Southern Europe and North Africa. With his 23 years of experience in biological pest control and pollination, Ward is a real asset for Biobest. Biobest, a global leader in this industry with headquarters in Belgium, keeps on growing steadily, and is therefore constantly looking for talented people. While his focus is now on the commercial side, Ward benefits from a thorough understanding of the technical aspects of biological (integrated) pest control. He already worked for Biobest from 1991 till 1999, first as a technical advisor (in export) and afterwards as a technical supervisor. During that period, he did IPM consultancy missions in Europe, Africa, North America, the Middle and Far East. 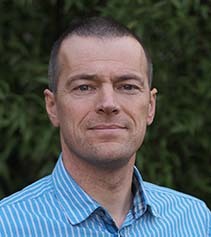 From 1999 – 2000 Ward worked one year for NAI (Nature’s Alternative International) in Vancouver, Canada as an area manager. From 2000 until 2014, he worked as European sales & marketing manager and business development manager for BCP & Certis Europe, a UK-based company active in biological control. Having lived four years in the UK, he moved with his wife and two children to Belgium in 2004. But also Belgium turned out to be an intermediate stop, as Ward now lives with his family in Austria. Ward Stepman holds a bachelor degree in horticulture (HoGent, 1990).